Crochet Elf Hat! Pretty awesome photo prop too! I make this hat from the bottom up. Some people start at the skinny tail end and work their way down, but I found that it was easier to make the main hat part first and then decide how long I wanted the tail part to be. I do use fpdc and bpdc here, so if you don’t know how to do them I’ve got tutorials or there’s always Google/YouTube. 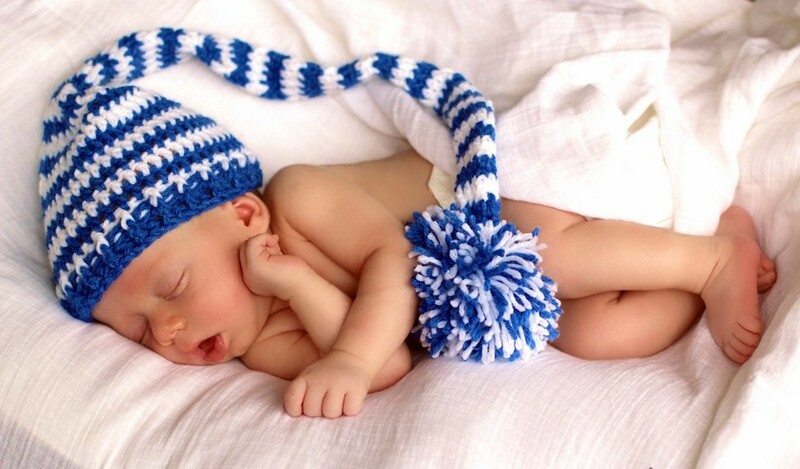 This entry was posted in Baby & Kids and tagged Baby, Crochet, Free Crochet Pattern, Free Pattern, Mikey, Photo, The Crochet Crowd. Bookmark the permalink. I usually start from the top down, I’ll have to try it this way! Love these hats. The Pom-Pom makers are life changing aren’t they?! I remember being a child and having a hat similar to that, but the tail tapered more gradually. I adored it because I could use the length as a scarf as well. I’ve been looking for a free pattern for an adult to no avail (would love it if someone could direct me). I’ve come to the conclusion that I must figure it out myself. I’m not sure why the focus is so heavy on babies. Why not adults? I made a hat over the weekend using this pattern. Its so well written. The hat turned out really cute too!! Its a great photo prop for newbie shots! The little hat is darling BUT the long tail on it is a STRANGLING HAZARD!!! That could get wrapped around a baby’s neck too easily. I make the ear flap hats with the braids short enough to prevent a horrible accident. I believe this is a photo prop… not meant to wear everyday. CUte pattern where do you find it?